Blurb Description: Fifteen-year-old Jackie Stone is a prisoner in her own house. Everything she says and does 24/7 is being taped and broadcast to every television in America. Why? Because her dad is dying of a brain tumor and he has auctioned his life on eBay to the highest bidder: a ruthless TV reality show executive at ATN. A terminal cancer patient SELLING his life to the highest bidder? And that bidder is a television network that intends to make a reality TV show about his death? When I heard about this books from the lovely people at Bloomsbury, I knew that I had to have it. And now, about half an hour after I finished, I'm... Befuddled? A mix of emotions I can't decipher? And I can't tell if I'm in love with this book, or just wish it was more. 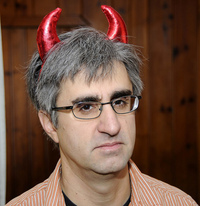 Jared Stone was a normal man. A part time graphic designer and part life longish father two two teenage daughter, his life was perfectly normal. Until, that is, he finds out about the high grade multiforme glioblastoma growing in his brain that has given him only three months left to live. And so, to ensure that his family will be well provided for without him there, he puts up his life for sale on eBay which gains the attention of a cyber-savvy nun, a billionaire looking for anything that will give him a high, people trying to help and a TV network. Soon, the Stone household is infested with cameras, crew, producers, directors and the eyes of millions of Americans all of whom are trying to watch a man fade from all that he is into nothing. 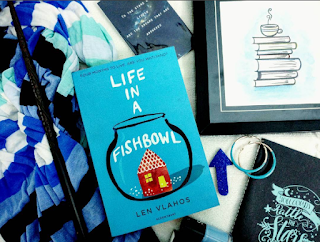 Told in multiple points of view - Jared Stone, Sherman Kingsborough (the billionaire), Sister Benedict, Ethan Overbee (the producer) Deirdre, Jackie and Megan Stone and the tumor, Life in a Fishbowl is one roller coaster that will leave you a blubbering bundle of emotions. While the book started off rather lightly, switching between viewpoints so fast I could barely keep up or feel anything for the characters, I soon got used to it, and the book was an intense portrayal of loss in the eye of the camera. One of the things I REALLY LOVED was that Jared's TUMOR had its own viewpoint that was actually quite unique and interesting. The only part of the book I didn't understand was the lack of focus on the emotional ending. All we really heard about the Stone family's decisions was that they cried. And then they cried some more, but there was NOTHING else, and I wish there had been. I also sort of felt bad for the crew and the network? I've seen the show UnReal and I realise that what they were trying to do makes for good TV, but the family did sign a contract and well, I guess that since there was SO MUCH going on REBELLING against the network just didn’t seem really realistic. After all, CONTRACTS are BINDING? All in all, it was a very unique book that was emotion filled that is DEFINITELY worth a read. 4 stars. What was the last "Reality TV" show that you watched? Are you a reality TV person, a documentary person or a fictitious TV watcher? What was the last book on cancer that you read? 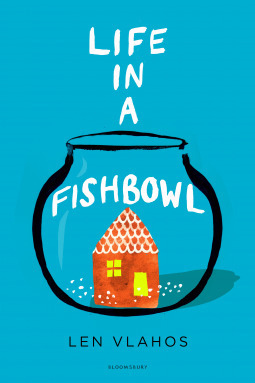 What do you think of Life In A Fishbowl?